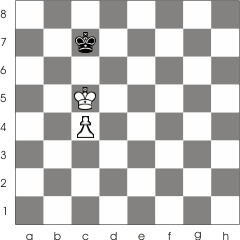 The term of opposition refers to the position of the two kings placed one in front of the other separated by a square. Obtaining opposition is very important in pawns endings and in many cases is decisive. Look at the following game. 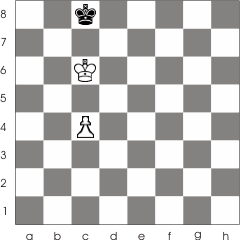 3... Kc8-b8 (or Kc1-d1) 4. 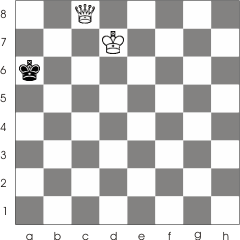 Kc6-d7 and now the white king has the promotion square under control. 4... Kb8-b7 5. c4-c5 Kb7-b8 6. c5-c6 Kb8-a7 7. c6-c7 Ka7-b6 8. c7-c8 and now White has promoted the pawn into a queen.The black king will inevitable be checkmated. Now let's take a look to the original position. If the white king has to leave the opposition 1. Kc5-b5 then the black king will maintain the opposition by 1 ... Kc7-b7 2. c4-c5 Kb7-c7 3. c5-c6 Kc7-c8 4.Kb5-b6 Kc8-b8 and the game ends a draw; White has to give up its pawn or there will be a stalemate situation.